6. Which is the better diet to lose weight…low fat or low sugar? The FDA has recently approved contact lens that adapt to light as glasses do. 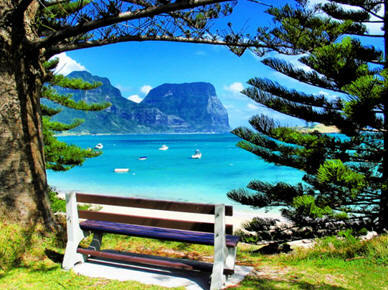 For outdoor sports or light sensitive people, this could be a definite advantage. Check with your optician to see if they are right for you! The FDA has announced that they are issuing permanent injunctions on 2 stem cell clinics (Florida and California) marketing non-FDA approved stem cell products and other violations. It is critical to investigate the clinics and doctors who are injecting stem cells even if it from the patient’s own body and are FDA approved. The Sarasota-Bradenton newspaper constantly has ads for orthopedic stem cell injections. There are hundreds of clinics throughout the country using the patient’s own stem cells usually from blood or fat removed and re-injected in joints and other parts of the body. Stem cells can have potentially serious consequences even if it comes from the same person. A woman at a Sunrise, Florida, Stem Cell Clinic went blind from stem cell injections into the eye for macular degeneration. This clinic has been sanctioned but still exists. The patients thought they were participating in a study from the NIH but they were not. These procedures have not been researched properly and patients should be very concerned about having procedures that are not FDA approved. It is the only agency that is trying to keep you safe! Some of these clinics are telling patients that the FDA has no right to not allow doctors to inject the patient’s own cells back into their bodies, declaring it is not a drug, which is under the jurisdiction of the FDA. Please talk to your primary care doctors before considering these procedures, since they will be familiar with most of the local doctors. Also know the complications of these techniques. The FDA chief, Dr. Scott Gottlieb, stated that the FDA has just begun to provide adequate oversight for these clinics. He cautioned that those who provide patients with wild claims of success should be careful of these rogue clinics. In part 1 of this chronic pain series, I discussed the opioid crisis, the need for an integrative approach to pain management, and the use of non-opioid medications. In part 2, I discussed the role of chiropractic care in treating chronic pain (primarily spinal causes). In part 3, I will report on the role of the specialist who is specially trained in sophisticated techniques to manage chronic pain, their credentials, and approaches to chronic pain, and their title is Pain Management Specialist. Why did patients start taking more pain medication in the late 1990s? Some of the answers! Prior to the 1990s, there was a perception in the the field of pain management that patients were not being treated aggressively enough. In 1996, the American Pain Society introduced the “5th vital sign”* recommending that doctors ask all patients in pain to subjectively grade their pain from 1-10. It was intended to track patients and their relief of pain. * The 4 other vital signs are blood pressure, pulse, respiratory rate, and temperature, and the 5th became the pain scale. Hospitals were graded (Joint Commissions on Accreditation) on their ability to minimize pain and unintentionally used more powerful pain medication to attain a better grade. What was not intended was that the medical profession and hospitals implied that patients should be totally relieved of pain. That was a big mistake, and this initiative to better control pain, many experts say, may have pressed doctors into prescribing more opioids to attempt to get patients completely out of pain. When oxycodone came out, a long acting opioid, the crisis escalated, and then those who were cut off by their doctors went to the streets for heroin and fentanyl (the cause of more than half of the overdoses). Today, the medical profession is asking patients to accept that some pain is to be expected and should not get in the habit of taking a “pill” anytime they feel the least amount of pain. Unfortunately many patients became addicted to the “high” that came with pain relief and started abusing the opioids. Chronic pain is not curable but controllable. That is a fact. Adapting to some pain and using non-opioid methods and non-medication methods for relief is a work in progress and is the basis for the integrative approach to pain management. Guidelines for all pain are adopting this approach. The pharmaceutical companies have been very slow to develop good pain medication that minimizes the “euphoric” effect of opioids and need to step up. The attempts to curtail the prescribing of opioids led Medicare and Medicaid Services (CMS) to limit paying for pain medication to 3 days for acute pain (in Florida) and 7 days if labeled “medically necessary”. But now the federal agency is limiting payment on opioid prescriptions for chronic pain patients which is creating a problem for deserving patients. Over correction is always part of the approach when the government gets involved. Doctors feeling the pressure are now writing fewer opioid prescriptions. There was a 12% drop in prescriptions in 2016, and a 10% drop in the potency and number of milligrams in the opioid prescriptions according to an article in Medscape News (April 19, 2018). Also, the number of non-opioid medication prescriptions for chronic pain doubled in 2017. That is good, but these medications have side effects that patients are now dealing with. There is no free ride when it comes to medications. 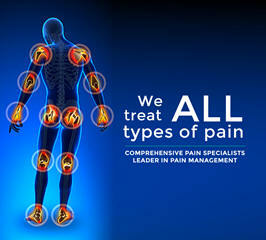 Pain management specialists are medical (M.D.) or osteopathic (D.O.) physicians that have had specialized training in the diagnosis and treatment of different types of difficult cases of pain. Many have been practicing anesthesiologists or internal medicine specialists before taking a fellowship (usually 1 year) to become board qualified in pain management. Although it is often necessary to manage a patient’s pain with opioids and other pain medication, the goal of this sub-specialty is to perform non-pain medicine procedures to alleviate or improve pain while carefully monitoring and managing the use of potent opioids. Pain management physicians are trained in procedures to alleviate resistant pain problems many of which have their origin in the spine, and they can often prevent the need for surgery. They are trained to perform special procedures that include epidurals, vertebral facet joint injections, spinal cord stimulation techniques, placement and management of pain pumps (morphine, fentanyl, etc. 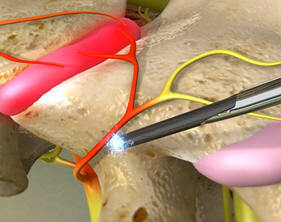 ), and radiofrequency procedures to relieve pain. I will explain these procedures. Since most of these injections and procedures are performed using ultrasound or X-ray (fluoroscopy) to place needles in precise positions for injections, they must be trained to perform these procedures under X-ray fluoroscopy using a C-arm fluoroscope with this equipment in their offices, as depicted in this photo. Special fellowship training programs are required after medical school and a certified residency in some form of specialty medicine, usually anesthesiology, internal medicine, surgery, etc. is required before they qualify for this training. These fellowships are run by accredited residency programs in anesthesiology, neurology, and physical and rehabilitation. Once trained, the physician can become board certified by the American Board of Anesthesiology, the American Board of Psychiatry, or the American Board of Neurology. It is important to ask about board certification from any doctor who is a pain management specialist. Primary care physicians are quite familiar with the best pain management specialists in their community. They will have knowledge of the experience and reputation of these specialists. Many primary care doctors are no longer willing to manage patients with resistant chronic pain patients and will refer them to these specialists. Because of this crisis, there is great demand for pain management specialists. These specialists will probably require a referral from a person’ treating physician. Because these specialists are swamped with patients, this has created the need for primary care doctors to shoulder many of these patients in their own practice and need to further their knowledge in pain management. There are now guidelines and online training programs in this subject for primary care physicians, but not all doctors are willing to treat patients in chronic pain without the guidance of these specialists. Pain management physicians may further subspecialize into specific fields of chronic pain management such as addiction, headache, chronic pain, pelvic pain, spinal cord disabled patients, neuropathic pain, cancer pain, palliative care, etc. 1. Epidural injections can be performed under fluoroscopy with local anesthetic and corticosteroid injected into the epidural space just outside the spinal cord or in the area of the facets (vertebral facet joints). The placement of the needle before injection is confirmed with a dye injection. I have had these injections and have had considerable relief. They usually need repeating and the frequency depends on many factors. Usually a series of 3 injections is performed over a few months. 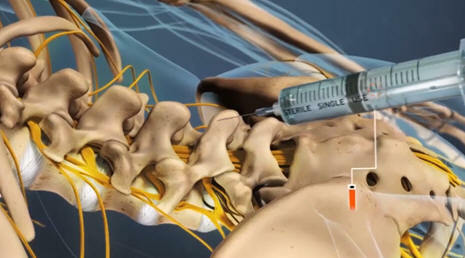 Below is a drawing showing a needle in the epidural space on the left. This space is just outside the dura (the covering of the spinal cord). In the right photo below, the needle can be seen in the epidural space under X-ray fluoroscopy. The pain management specialist uses this radiographic technique to assure the needle is in the correct place. 2. Injections into the neural foramen (arrow below) also can be performed. This is the space between the vertebrae where the nerve roots travel from the spinal cord out to the body. 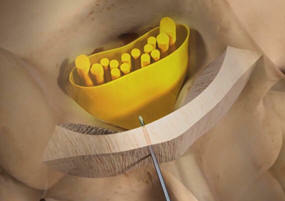 Pain management specialists are not the only doctors that perform nerve blocks. Anesthesiologists and surgeons use nerve blocks to perform surgical procedures under spinal anesthesia or for extremity surgery, deliver babies, etc., but it can be used to relieve chronic pain. Very specific injections of local anesthetic and corticosteroids can relieve the formation and release of inflammatory cytokines by inflamed nerves which reduces swelling and pressure. Nerve blocks may be performed under X-ray fluoroscopy or CT scan as mentioned earlier. Blocks usually provide temporary relief and frequently need to be repeated. 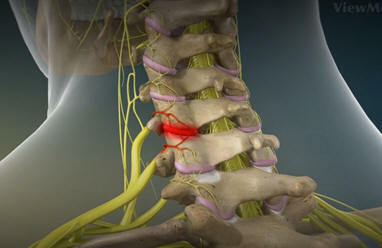 Occasionally, the nerve may need to be permanently destroyed (called rhizotomy) because of the severity of pain or lack of relief from more conservative methods. There are different methods (freezing, ultrasound waves, radiofrequency, etc.) to perform these procedures. 4. Trigger point injections can be performed in areas of hypersensitivity. Deep tissue massage also can address these areas. They can be injected with corticosteroid and local anesthetic, and even Botox may be used to temporarily paralyze muscles in an area with good success. Trigger points are also treated with electrical stimulation, heat, massage, ultrasound, and even dry needling. Osteoarthritis is the most common cause of facet pain. 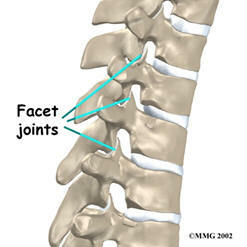 The facet joints connect the vertebrae, as seen in the drawings below. 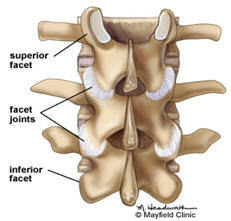 The facets meet at the lateral aspect on each side of the vertebrae and provide stability of the spine. Note the body of the vertebrae is cushioned by the discs. Steroid injections relieve pain for a period of time, but made need repeating every few months depending on the pain levels. For patients who are in constant pain, a battery powered pump can be implanted under the skin that time-releases opioids directly into a vein. The doctor’s office injects more medicine in the pump when necessary (usually weekly). Fentanyl and other potent opioids are commonly used. Neuro-stimulators are often used in spinal cord injury patients who suffer from numerous types of pain, but can be used in severe back pain and other pain patients with peripheral neuropathies. A recent study from Vancouver, B.C. clearly showed superiority from electrical spinal cord stimulation in patients with intractable spine and limb pain over opioids and other medications. Higher frequency stimulators are stated to be better at reducing pain since the older stimulators used a lower frequency. Some of these are surgically implantable in the spinal cord and are proving to be cost-effective. 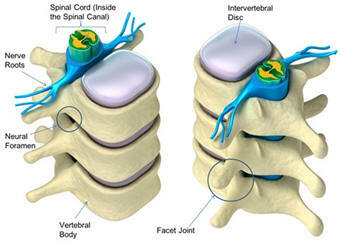 Improvements are being made in spinal cord injury centers. Most are familiar with TENS units (transcutaneous electrical nerve stimulator) which are used to stimulate the muscles and nerves that have spasms and pain through the skin. Chiropractors and physical therapists commonly use these units. It can help pain and prevent atrophy of muscles. There is even an OTC (over-the-counter) product out now. 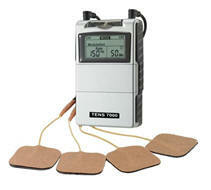 Below is a TENS unit. 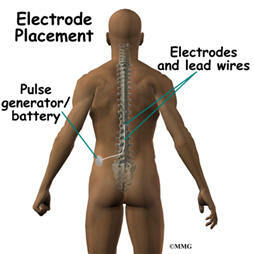 Electrical stimulators can be attached to needles for acupuncture or similar battery powered devices can be implanted in the brain, spinal cord, or muscles. 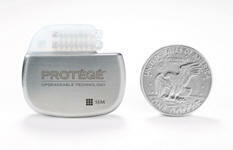 These implanted stimulators can be implanted in the brain, spinal cord, or muscles. 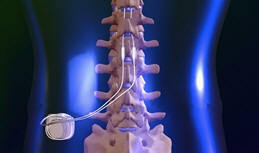 Wires are surgically placed in the specified pain area with a battery powered device placed under the skin or connected to a battery pack that is wireless. 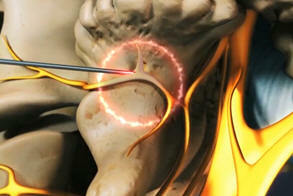 Radiofrequency neurotomy is performed to relieve pain in the facet joint and sacroiliac joint. This procedure is performed using a needle attached to a radiofrequency machine. It partially destroys the nerve to that specific area using heat with a 30-50% success rate. Radiofrequency ablation is performed in a similar manner but an electrical current is passed through the needle to heat the specified area or nerve. 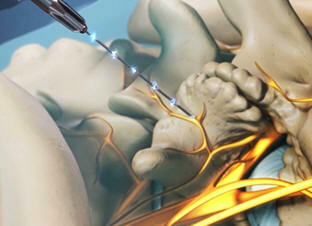 These drawings show placement of the needle and using radiofrequency to heat the nerve causing the pain. Below is the same procedure performed in the neck. 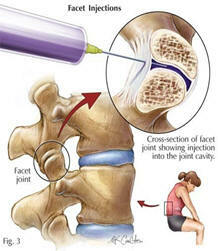 The facet is inflamed and the specific nerve to that facet is heated with the radiofrequency needle. These procedures fill the major portion of a pain management specialist’s practice. 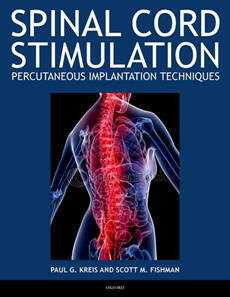 The indications for these procedures are based on the severity of pain and the failure of more conservative methods. It is important for patients to understand these are complementary methods and many of the patients will require medication and other complementary techniques, and these procedures may likely need to be repeated if pain returns. Fractures in the elderly are a major health hazard. By 2025, it is estimated that the annual incidence of fractures will reach 3 million annually. The most common fracture in the elderly is a hip fracture from a fall. Osteoporosis is an increasing risk factor for our aging. I have discussed osteoporosis and the need for preventative Vitamin D3 (400 IU daily) and adequate calcium intake (1000mg daily) in the general population of postmenopausal women to prevent bone loss. Not that the USPTFS*recommends these levels but in the form of foods rather than supplements. These levels do not apply for those with osteoporosis as they will need supplementation. Prevention is key. *USPTFS=United States Preventative Task Force Services. They are a major advisory group for the federal government to recommend guidelines for health screening. 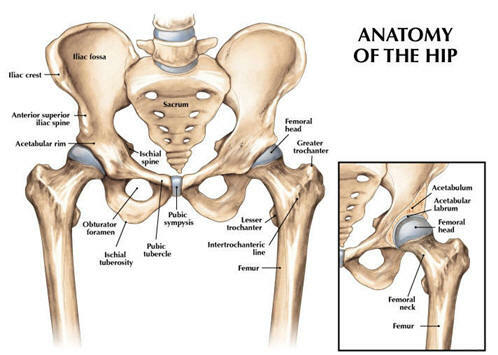 The hip is the upper part of the thigh bone (femur) that connects to the pelvis as seen below. The head of the femur is a ball and socket type of joint as it fits into the acetabulum (socket in the pelvis). Note there is an angle to the femur (the part that sticks out that can be felt is the greater trochanter) as it fits into the pelvis, and that creates a weakness in the hip just above the trochanter where fractures occur the most often and called the femoral neck. The fracture names are based on these specific anatomical locations. Below are the anatomical sites. 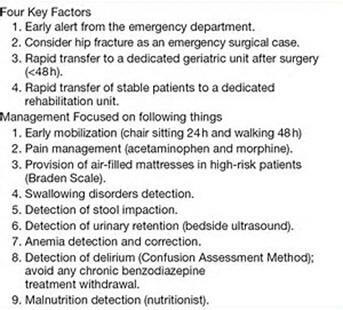 Hip fractures should be considered an emergency and need urgent management. The American College of Surgeons recommends surgical repair within 48 hours, however, the latest research states that surgery should be performed within 24 hours to prevent complications during the first 30 days after surgery such as heart attack, pneumonia, and, embolism. (NEJM-Journal Watch, Nov., 2017). Patients who are nursing home bound and break a hip may not be candidates for surgery. This is a difficult clinical dilemma. Hip fractures are one of the most costly injuries in the U.S. costing several billion dollars annually with an estimated 300,000 hip fractures a year and 90% occur in people 50 years and older. 95% are caused by falls. Women sustain 75% of these fractures. Risk Factors include osteoporosis, fraility, balance issues, visual difficulty, smoking, alcohol, chronic illnesses, and even metastatic cancer that contribute to the number. 15% of women will break their hip at sometime in their life. 20-30% will die within one year, nearly 40% will never walk independently, and 20% will need to receive care from a long term care facility. Fractures occur most commonly at the femoral neck as stated above. Below is a drawing denoting where fractures can occur. 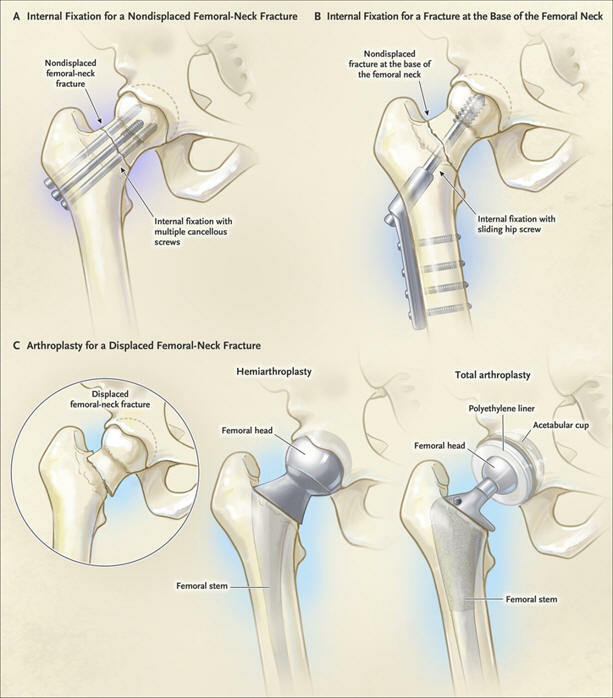 If the fracture is stable enough to replace the fractured ends of the hip, screws (first image) are used to stabilize the fracture (image A). 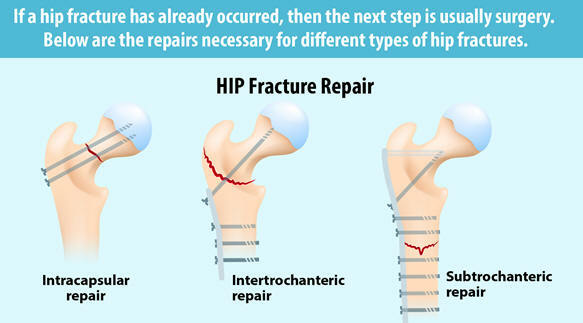 This is the treatment of choice if the fracture is not out of place. In the drawing (image B) demonstrates using plates and screws. The C. image (above drawing) demonstrates the procedure called arthroplasty. This is preferred especially for patients over 65 because there is a lower rate of having to repeat the surgery in the future. 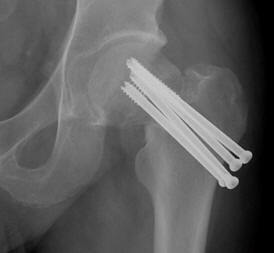 Dislocations of this hip prosthesis can occur. 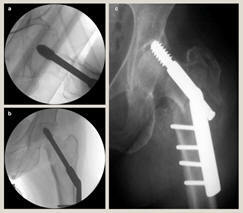 Arthroplasties can replace part of the hip or totally. A partial arthroplasty (shown above) involves replacing the head and neck and inserting a prosthesis into the pelvis socket. The ball and neck of the femur are removed and replaced with this prosthesis (just like in a hip replacement). A total arthroplasty involves replacing the head and neck but also adds a prosthesis into the pelvic socket to accept the prosthesis. The reason the head and neck of the femur are replaced with a prosthesis in displaced fractures is the concern for avascular necrosis, which means the blood supply to the normal head of the femur is lost and would degenerate over time. 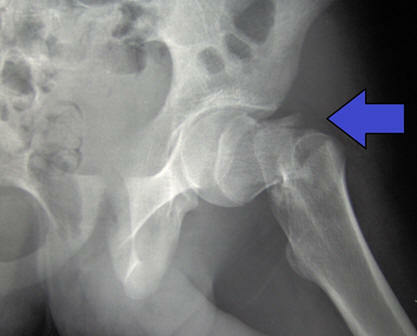 This phenomenon actually can occur by itself in patients with autoimmune disease requiring a hip replacement. These fractures are more stable and are treatable by internal fixation (screws or plate and screws). These are the least frequent fractures but are the type of fracture that can occur with the use of osteoporosis medications called biphosphonates. 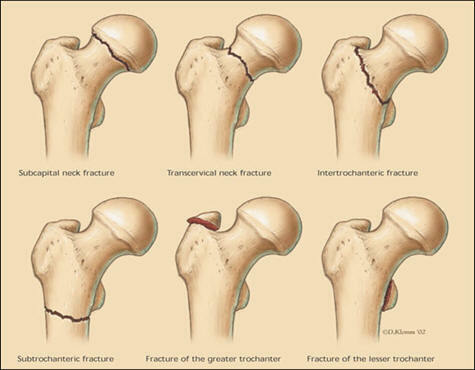 There is a 35% failure rate because the fracture fragments more than the others. These fractures are treated with intramedullary nails. Because these patients are frequently elderly, the postoperative phase and rehabilitation is critical for a successful operation and minimalization of complications. Complications include clotting (thrombosis) in the leg veins and embolism to the lungs, pneumonia, and cardiovascular events. Underlying disease (comorbidity) can predispose individuals prone to fracture including osteoporosis, certain medications, smoking, alcoholism, metastatic cancer, etc. Physical and occupational therapy plays a critical role in these patients. There are 2 factors to consider with any acute hip fracture: 1) is the patient healthy enough to undergo an operation safely? 2) can the operation be performed quickly? 3) what type of operation can be performed based on the anatomic location of the fracture or the degree of displacement of the fracture. Without surgery, the death rate is four times higher. Mortality at 1 month is 10%. Disability is a serious concern even without major complications. Even if the patient lives at home at the time of the fracture, 11% become bedridden, 16% must go to a long term care nursing facility, and 80% use a walking aid at 1 year. The quality of life of these individuals and their caregivers is substantially changed. The mortality rate at one year is as high as 36% despite aggressive therapy including surgery and rehabilitation. Reoperation can occur in 10-49% and has fueled extensive research in addressing these fractures. 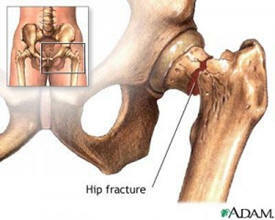 Hip fractures carry with it serious consequences including death and serious disability. This population of patients and their caregivers must have a preventative mindset to not increase the chances of creating an increased risk of falls. Balance and vision problems along with risky behavior all must be addressed in this elder population who do not want to hear they must be more careful, give up their car keys, use a walker, have safety features installed in their homes, and even consider moving to an assisted living facility for help. Adjustment of living conditions and getting help in the home must be addressed. Anyone who has gone through this process with elderly parents is aware of the enormous obligation caregivers must take. It is better to have these discussions before a serious accident occurs (head injury, hip fracture, wrist fracture, etc.). Seek the aid of their doctors. Prevention with strengthening with weight bearing exercises, balance exercises, yoga, safety aids, treatment of osteoporosis, stopping smoking and alcohol, and getting assistance when indicated all will help prevent this serious injury. Improvement in vision and household modifications, are critical too. I. Vitamin D and calcium supplementation in community care facilities?? For some of you, the recommendations for supplementation may surprise. The USPSTF* recommends supplementation only for those with osteoporosis or Vitamin D deficiency. For those who are premenopausal women and in all men, the USPSTF continues to not recommend supplementation for the prevention of fractures or falls. That does not mean there is not a dietary recommendation stated early in this report. For those older patients in community care facilities(without osteoporosis or vitamin D deficiency), Vitamin D and calcium supplements are not recommended because of the increased risk of kidney stones. This is a change in recommendations since 2012! They do recommend strengthening programs, and exercise as vital to prevent falls. There are continuous studies ongoing to assess supplementation. Dry eye syndrome is a multifactorial disease of the tears and the ocular surface. This is a common eye disease and can overlap with other eye diseases including allergic eye disease, and diseases of the eyelid margin (meibomian glands are the oil glands that lubricate the margin of the eyelids). Note the position of the lacrimal (tear) gland and the drainage system that drain tears into the nose in this drawing. Most begin to suffer with this disease after the age of 40 affecting 10-30% of the population with twice as many women suffering than men. Early detection is necessary to prevent permanent damage of the ocular surface (cornea and conjunctiva). The main cause is inflammatory dysfunction of the meibomian glands along the margin of the eyelid. 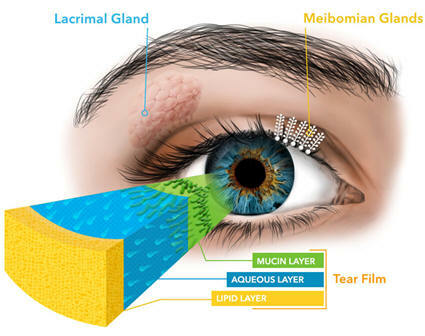 Although tear dysfunction from the lacrimal glands causes dry eye, dry eye syndrome is created by the meibomian glands not functioning correctly. 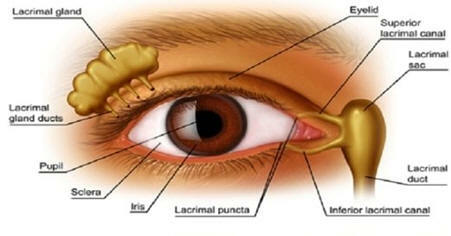 Without proper function of these glands there is a deficiency of retaining a tear film over the eye surface. The cause is unknown. Below is a diagram that illustrates the meibomian glands (arrows) that provide the film that protects the surface of the eye. The drawing below demonstrates all the meibomian glands along the lid margin. 1) lipid layer 2) aqueous (water) layer 3) mucin layer (proteins) 4) Meibomian lipid (oil) layer. The function of each component is in this drawing all necessary for a normal tear film. 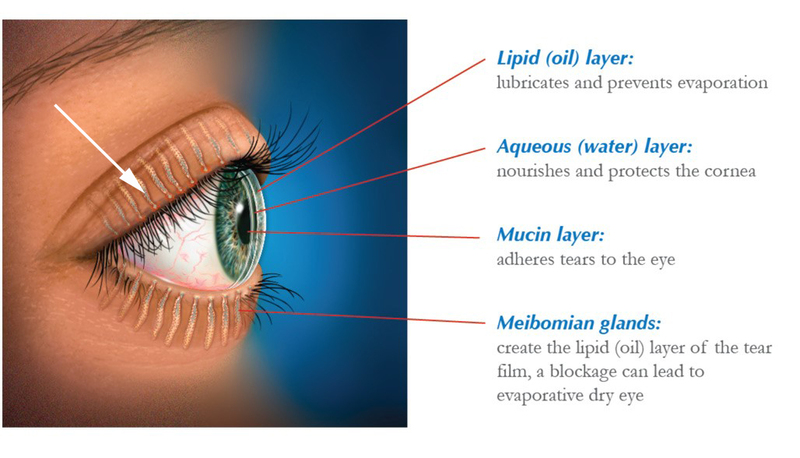 The second also illustrates the components of the tear film. Arrow points to the glands. There are several reasons for deficient tear production including dry eye associated with Sjogren’s Syndrome, lacrimal gland deficiency, lacrimal gland duct obstruction, reflex hyposecretion, and systemic drugs causing dry eye (beta-blockers, antihistamines, and glaucoma eye drops). Paradoxically, many patients present with excessive tearing in an attempt to compensate for tear dysfunction. Dryness usually worsens as the day ends. They include a foreign body sensation, redness, mucus discharge, irritation, dryness, photophobia (light hurts the eye), itching, and blurry vision. Keratoconjunctivitis sicca is an autoimmune inflammatory disease of these glands and co-existing other autoimmune diseases such as rheumatoid arthritis, thyroitis (Hashimoto’s disease), may be present. A dry mouth might indicate the autoimmune disease, Sjogren’s Disease, which is associated with salivary and lacrimal gland swelling, ultimately with decreased secretion causing dry eyes and mouth. There are a variety of eye diseases that must be ruled out by an ophthalmologist. A sophisticated number of tests must be done to workup these patients properly. This will include staining of the cornea to observe for corneal abrasions, ulcers, and other diseases. A tear test (Schirmer’s) can quantify the amount of tearing. The tear breakup time test is commonly used to diagnose this disease. Fluoroscein (yellow stain) is instilled into the eye, which will highlight dry spots, corneal abrasion, etc. to appear on the cornea easily seen using a slit lamp. These dry spots can appear as fast as 10 seconds. A minor salivary gland biopsy may be necessary to diagnose Sjogren’s Syndrome (biopsy on the inside of the cheek is the easiest access to minor salivary glands). Treatment includes added lubrication and topical cyclosporine (Restasis), which aids in the watery production component of the tears, decrease cytokines (inflammatory proteins), and increase goblet cell density which aids in combating the inflammatory process. Omega-3 fatty acids (prescription strength is called Lovaza) also combats the inflammatory process and helps the production of tears. However, OTC Omega-3 supplements are not much help because it takes a huge number of capsules to be effective. An antibiotic doxycycline 100mg twice a day orally may be necessary to treat secondary eye infections. 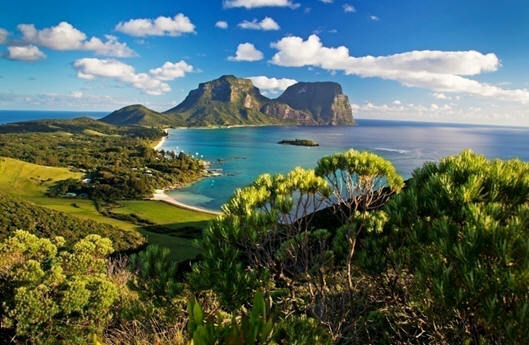 Intense light pulse therapy has been successful in certain cases. Topical eye antibiotic with or without cortisone, topical 0.05% cyclosporine (Restasis), and artificial tears and gels are used. A new drug FDA approved in 2016, lifitegrast (Xiidra), blocks a specific pathway in the inflammatory process and has proven to be effective. Education about the disease and what makes it worse in the environment is very important. 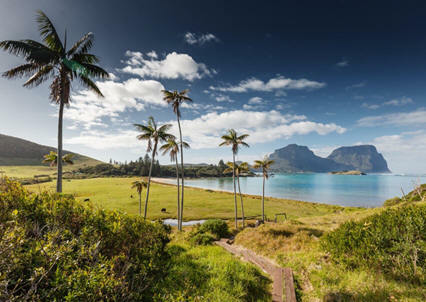 Eliminating environmental hazards, taking prescription omega-3 fatty acids, and identifying any medications aggravating the disease are important recommendations. Adequate use of topical eye lubricants, and using proper eyelid hygiene to clean the lid margins are part of the regimen. A very mild soap solution and warm compresses with gentle wiping of the lid margins with a Q-tip help. Talk to your eye doctor about these suggestions. There are also tear conservation therapies (moisture chambers, plugging of the tear duct, etc.). Eye protection may include special contact lens. In severe resistant cases, special surgical procedures may be necessary. This is a very common eye disease, therefore, if you have any of the above symptoms after the age of 40, seek consultation with an ophthalmologist. Prevention of corneal abrasions and ulcers is absolutely necessary. COPD (chronic obstructive pulmonary disease) includes the diseases chronic bronchitis, emphysema, and asthma since there is a component of obstruction of the airway in all 3. There are technical differences for sure, but any chronic lung disease will create eventually the same result—disability and deterioration of the patient’s lung capacity, shortness of breath, and complications such as pneumonia. The chronic airflow limitations of COPD are caused by a mixture of disease and lung tissue destruction which may vary with narrowing of the airway structures and mucus buildup and dysfunction. Thickening of the lining of the airway and increased mucus production will follow. Gas can get trapped in pockets of obstructed airway. 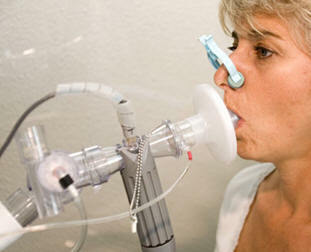 Airflow limitations are measured by spirometry (described later). Chronic respiratory symptoms may preceed any evidence of spirometry test abnormalities. Remember COPD is a group of different diseases and that will determine the path these patients will follow. Chronic bronchitis usually develops from continuous inhalant of irritants, very commonly cigarette or marijuana smoke, secondary smoke, hazardous occupational inhalants, and environmental inhalant allergens. This chronic irritation creates continuous inflammation in the bronchi (tubes to the lung tissue all the way down to the smallest unit--the alveoli) of the lungs, and loss of the functioning lining of the bronchi, so that mucous is not easily removed from the airway causing complications. The anatomy is explained below. A new study (the journal, Lancet, April, 2018) has reported that COPD can be predicted with a high degree of certainty as early as childhood. Factors include asthma, allergic rhinitis, bronchitis, pneumonia, and maternal smoking. 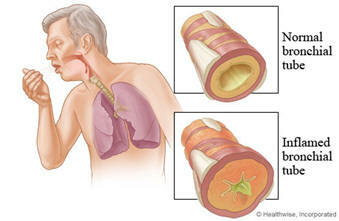 If these people smoke or have asthma as an adult, the likelihood od developing COPD increases. 2400 volunteers were followed from age 7-53 with a standard lung function test called forced expiratory volume-FEV1 (the amount of breath forced out of the lungs with a maximum inspiration and expiration). These people scored lower FEV1 results from the age of 7. This information must be used positively to treat these people aggressively and physicians must encourage them not to smoke or stop smoking if started. Women now make up 58% of patients with COPD, thanks to an upsurge of marketing cigarettes to women in the 1960s. Remember, “You have come a long way baby” from L&M cigarettes and Virginia Slims. Yes they have! 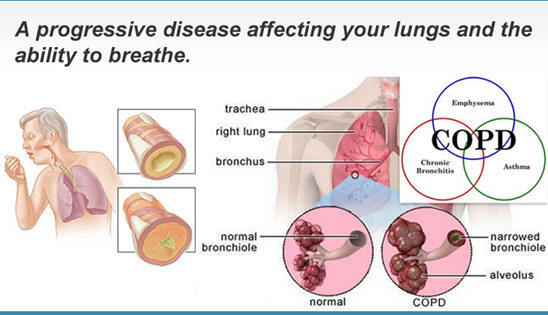 COPD is a leading cause of mortality and illness (morbidity). Smoking is the number cause of COPD. Globally as far back as 2010, it was estimated that there were 384 million sufferers with 3 million deaths annually and 4.5 million deaths by 2030. 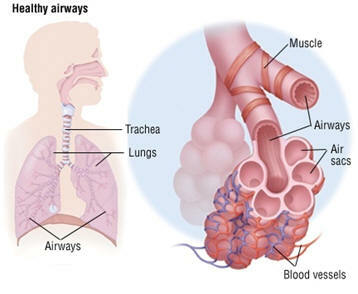 The lungs are part of the respiratory tract and are a continuum of the upper airway beginning with the larynx (voice box), the trachea, the bronchi, the bronchioles, and alveoli. The nasal cavity helps filter foreign matter out of the air and warm the air that traverses through the nose into the throat, larynx, the trachea, into the major bronchi, into the smaller tubes of lung called bronchioles, and finally into the alveoli, which are the actual portion of the lung tissue that exchanges oxygen for carbon dioxide (drawing#2). These air sacs exchange oxygen for carbon dioxide, and if there is damage to these sacs (alveoli), the exchange is interfered with. Also these sacs (blebs) can rupture into each other causing larger functionless tissue, which drop the exchange of gases (oxygen and carbon dioxide). This is the hallmark of emphysema, probably the most severe cause of COPD. This drops the oxygen levels in the body creating cardiovascular and pulmonary consequences. Smoker’s lungs are attractive aren’t they? (similar to black lung in coal miners) (drawing below), and emphysema is inflammation in the smaller bronchioles and alveoli. Swelling is seen in the Inflammation of the lining of the bronchi from inflammation and creates excess mucus, which stimulates a cough to expel that mucus. If the mucus stays in the lungs, it can lead to pneumonia, which is really infected mucus. Acute bronchitis occurs with many upper respiratory infections. Chronic bronchitis occurs over time from persistent or recurrent irritation of the lining of these bronchi, most commonly from inhaling cigarette smoke. Swelling of the bronchi causes difficulty breathing, cough with production of mucus (sputum), and if excessive wheezing similar to asthma. In fact, asthma affects the same part of the airway but is caused by allergies and not usually infection. Even though I am not specifically discussing asthma in this report, I must mention there is a new type of treatment for cortisone-dependent asthmatics which will reduce the dependency on prescription corticosteroids (70%) to keep their airways open (actually improving the spirometry readings). It is the use of biologics (human monoclonal antibodies which acts against interleukins which are inflammatory markers and influence the immune system in asthma)—dupilumab, which reduces exacerbations of severe attacks as well as reducing dependency on steroids (which has serious side effects). There will be much more to say about this breakthrough. 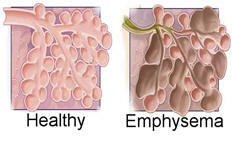 There is a rare type of hereditary emphysema caused by the lack of an enzyme (alpha 1-antitrypsin), which is necessary to dissolve mucus because inflammatory disease in the lungs secrete a protein called trypsin, which is destructive to lung tissue. 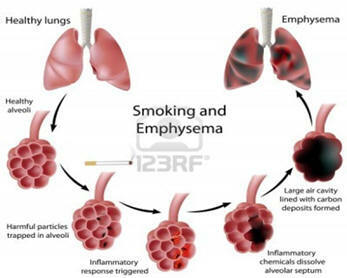 By far, emphysema is caused by cigarette smoking. 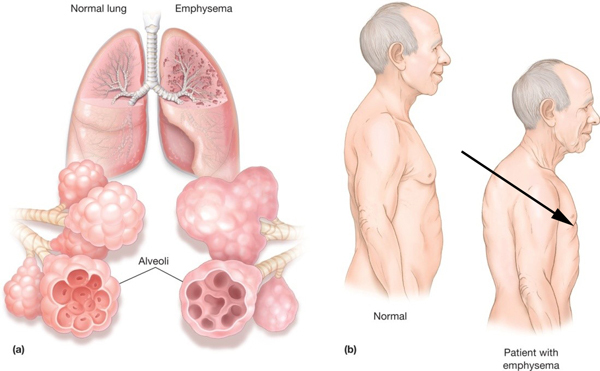 Below is a drawing of the stages of COPD-emphysema resulting in destruction of lung tissue and formation of useless sacs of air in the lungs. Ultimately, the air sacs in the lungs (alveoli) get inflamed with ultimate destruction and the formation of larger air sacs (blebs) that become less functional in exchanging gases (oxygen and carbon dioxide). This can cause a pneumothorax (collapse of the lung) and can occur spontaneously from coughing, and it is a medical emergency because shortness of breath will be severe. This usually happens in emphysema. 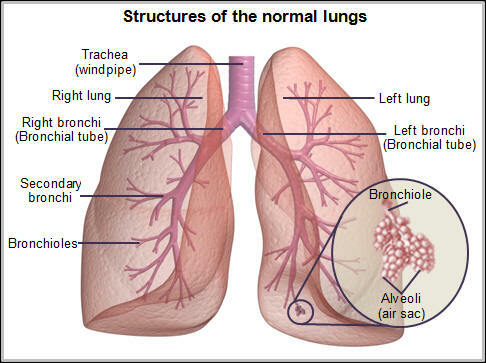 The bronchi and bronchioles are the small branches of the bronchial tree. Smoking cessation (90% are smokers) is a major requirement to hopefully stop the progression and perhaps reverse this disease. 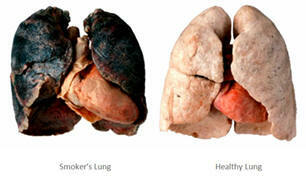 Unfortunately, many do not stop smoking. If chronic bronchitis is left unchecked, it can be permanent and lead to destruction of the alveoli (see photo) progressing to emphysema. Chest X-rays are rarely valuable in early disease and COPD is a clinical diagnosis based on the history of recurring pulmonary episodes. Of course, later in the disease pneumonia can be diagnosed and cardiopulmonary complications (enlarged heart, etc.) which will occur as COPD progresses. Cancer of the lung must also ruled out as most of these patients are smokers. 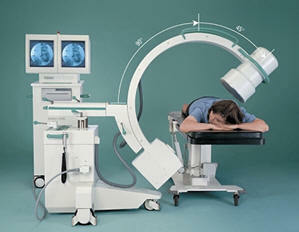 Spiral CT scans are now recommended yearly to try and catch cancer early when it may be curable. Check with your doctor about this even if you have quit but smoked cigarettes for 30 years (pack years based on the number of packs per day-i.e, 30 pack year could mean 3 packs per day for 10 years). The diagnosis of COPD is made clinically using a medical history and lung function tests (spirometry). This is an office procedure usually in a pulmonary specialist’s office. It is a test that measures the ability of the lung to move air, oxygenate the blood, and also measure how well air can be forced out of the lungs, which is impaired in people with these diseases. These tests can measure the extent of disease and may need to be performed as these diseases progress. Spirometry can also help determine therapies based on the severity of the results and can even having some bearing on considering a lung transplant. 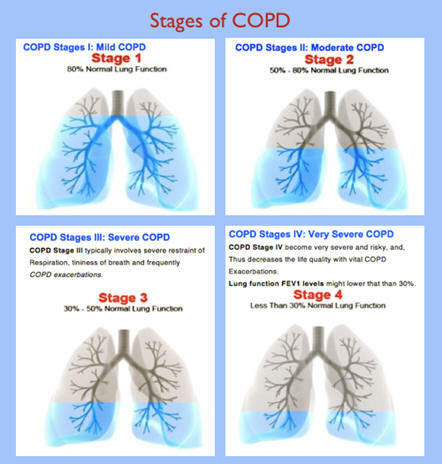 There are 4 stages of COPD as designated by the Global Initiative for Chronic Obstructive Pulmonary Disease (GOLD staging) and is based on the spirometry findings. This determines the severity of disease and ultimately predicts loss of years of life (as much as 5 years). Most patients present with a chronic hacking cough, waking with a cough, productive of mucous or not, in a smoker, who may or may not have a raspy voice, hoarseness, difficulty swallowing, or a sense of a lump in the throat. An ENT doctor needs to inspect the airway (lower throat and larynx (vocal cords) for cancer and other evidence of diseases. A pulmonologist may recommend a flexible bronchoscopy to inspect the bronchial tree looking for early cancer, obstructive signs, etc. 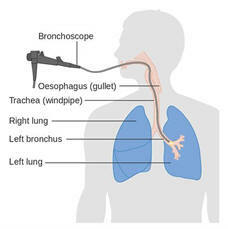 Below is a test using a flexible tube to look into the lungs (bronchoscopy) depicted on the drawing on the left below and the appearance of the bronchi on the right drawing. Shortness of breath and some mild wheezing can occur with acute episodes. Gastric reflux is a serious contributor to these diseases and must diagnosed and treated. Chronic coughing causes gastric reflux to worsen. Sleeping in a propped up position, weight loss, taking anti-reflux meds, and restricting fluids several hours before bedtime will help. Usually patients with COPD get short of breath when lying down and have to sleep on 3-4 pillows (a sign of trouble), therefore, that would help prevent reflux. Evaluation for obstructive sleep apnea is also necessary to be sure this is not an additional pulmonary issue which can complicate COPD rather severely. A CPAP (continous positive airway pressure) machine worn at night is necessary to keep the oxygen levels up when an apneic episode occurs. Apnea also causes the same stresses on the heart and lungs as COPD, so this is double jeopardy. The treatment of all these pulmonary diseases is similar. As always, prevention of progression is critical by stopping smoking, protection from environmental toxins and secondary smoke, etc. prevention includes taking the influenza vaccine yearly, and the pneumonia shot (Pneumovax), and avoiding people with respiratory illnesses. The flu or pneumonia can be very severe in these patients necessitating hospitalization. Deaths from the flu include a significant number of COPD patients. The medical treatment centers around keeping the airway anatomy as open as possible (using bronchodilators), nebulizer treatments (IPPB—intermittent positive pressure breathing)-breathing machines with special medicine), and anti-inflammatory meds. Anti-inflammatory medications may be necessary including inhalant corticosteroids. Supplemental oxygen 24 hours a day may be necessary to keep their blood oxygen levels adequate (in the 90+% range). Oxygen therapy can increase the survival of patients with severe resting hypoxemia (low oxygen), however, long term oxygen therapy in those with stable COPD with moderate or exertional hypoxemia does not lengthen lifetimes or reduce the risk for hospitalization. There is always strong emphasis on treating the other diseases (comorbidities) a person has, as they have a great influence on COPD and how it affects the whole patient. Diseases such as sleep apnea, osteoporosis, cardiovascular disease, anxiety and depression, and gastric reflux must be controlled. Exercise (walking) is also critical to cope with the physical and emotional toll of being short of breath 24 hours a day. There are surgical options as well. Lung volume reduction surgery, removal of large blebs, and lung transplant all may be necessary. It is important to note that as the severity of COPD progresses, the disability from chronic lack of oxygen (hypoxia) creates constant shortness of breath and interference with their quality of life, ability to work and exercise. Cardiovascular, pulmonary, and other complications occur as stress on the heart occurs trying to overcome chronic hypoxia. Heart failure, heart attack, pneumonia, pulmonary hypertension, osteoporosis (from taking corticosteroids), weight gain from inactivity, pneumothorax (collapse of the lung), and sleep difficulty from shortness of breath. If a lung collapses (pneumothorax), this is an emergency. Sudden severe shortness of breath will occur. 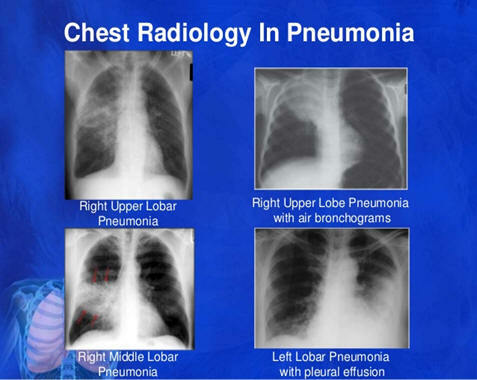 Below is a chest X-ray demonstrating a pneumothorax on your left (dark area of lung). Note the shift of the heart to the right, which presses on the other lung causing further shortness of breath. 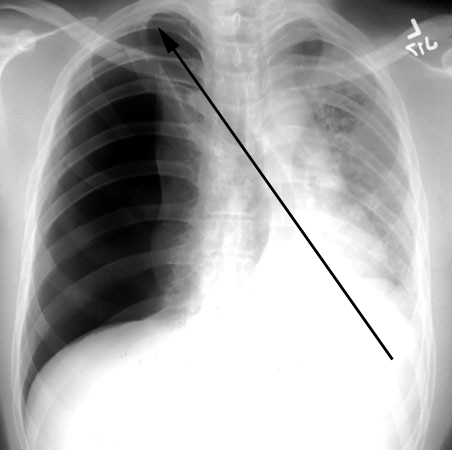 The arrow points to the pneumothorax. Loss of productive years of life is a serious disability and the most potent concern for most of these patients. Pneumonia and heart failure leads the major concerns as well. 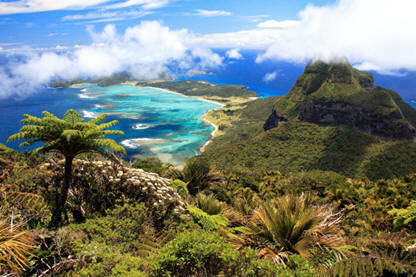 Not being able to breathe normally cannot be underestimated and is incredibly disabling. Pneumonia is one of the dreaded complications for patients with chronic lung disease is infection in the lungs. With infection, breathing is even more labored, and having to cough up infected mucus is exhausting. One third of these pneumonias are viral, therefore, it is critical to know if the cause is bacterial or viral since antibiotics will not help a viral pneumonia. Most sputum cultures take at least 48 hours to get the results. The white blood cell count may or may not be elevated but is non-specific. Routinely doctors are likely to start antibiotics because they can’t clinically differentiate a bacterial from a viral infection, so this test may be valuable. Time will tell if it continues to be correct in its value. Limiting antibiotics in COPD patients is necessary to prevent resistance to many antibiotics in these patients, since they require antibiotics frequently. Vaccines are important to prevent pneumococcal infections (the pneumonia shot). Also the flu shot is critical to minimize the chances of developing influenza which may lead to pneumonia. The 5 year mortality rate varies from 40-70% depending on the severity of disease and aggressiveness of treatment. For those with severe disease, there is a 50% 2 year mortality rate. 6. Which is better….a low fat or low sugar diet to lose weight? Getting to the “meat” of the issue! There has been a long debate about which diets are best and certainly the debate continues regarding a low sugar or low fat diet. It is extremely difficult to limit both, however, a recent report has shed some light on the subject. A patient’s health issues play a large role in determining how a diet should be chosen. This is extremely important for example in overweight diabetics, those with heart or kidney disease. Study results conclude that both type of diets are equally effective in losing weight. Those with high cholesterol and or triglycerides can be decreased with medication and diabetes can be controlled with either insulin or oral hypoglycemic agents, but patients must take responsibility by following healthy diets regardless of type. However, recent studies have once again condemned sugary drinks including soft drinks and fruit juices because they cause increased all-cause mortality and coronary artery disease deaths in middle aged adults, particularly those who are overweight or have low income. Clinicians should counsel patients about avoiding these sugary drinks. (Reasons for Geographic and Racial Differences in Strokes study). No association was seen between consuming high sugar content in food and mortality because the sugar is metabolized more slowly than with sugary drinks, as reported in a recent American Heart Association Scientific Sessions in 2018. Think of sugary drinks as nothing more than liquid sugar! Limits of salt, saturated fat, sugar (sucrose, glucose, etc. ), and processed meats make the most sense with intake of plenty of vegetables, fruit, lean meat, and daily exercise. Remember, exercise raises the metabolic rate of burning calories and that make our body machines more efficient. The best diets are annually reported in the U.S. News and World Report and this year the Mediterranean and Dash diet tied for first. Most experts would love to get rid of the word “diet” because it implies work for a period of time rather than a life style change regarding healthy food intake. Too many people lose weight, but put it right back on, because they can’t stick with a permanent change in their diet that caused the problem in the first place. At the end of the day, it is simply about intake of calories and burning more calories than is taken in. Daily exercise can increase the metabolic rate and the body can burn more fat. 1) Do you know your calcium score—for coronary arteries?